It has been a busy close season for Team LNT – a new and impressive factory, a much improved and updated Esperante, a successful search for new driver talent and the final build of Europe’s first customer Esperante for the Chad Peninsula team. Last weekend the team’s efforts were firmly behind the two car effort to have a winning start to the gruelling challenge that is the Le Mans Series. 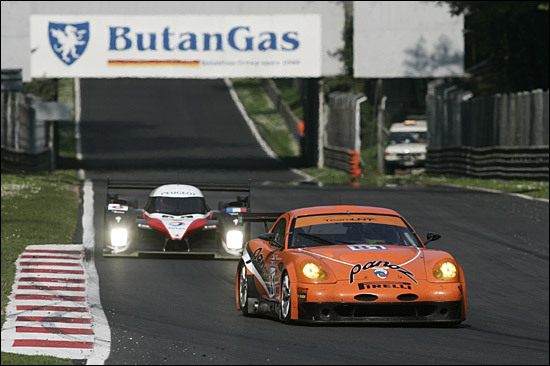 The first of six 1000km races took place at the historic Monza circuit and from the off it was readily apparent that the GT2 category in the Series has taken another step forward. 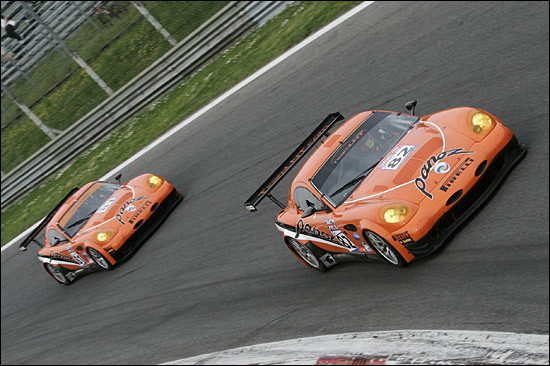 The pair of orange Esperantes featured at the very front of the action throughout 2006 but to repeat that success this season they would have to do battle with a battalion of brand new Porsche 997s and a squadron of very rapid Ferrari 430s, as well as the factory Spyker team. Team LNT’s new (not so secret) weapons though were ready to rumble. The very rapid Danny Watts joins LNT stalwart Tom Kimber-Smith in the #81 car whilst Richard Dean is joined for the season by French hotshoe Lucas Lasserre (right) in the #82 machine. That recognised the fact that whilst modern day 1000km races are run at a furious pace, the dual issues of a very busy race track and the ever present danger of a mechanical problem or other mishap bring with them both risk and opportunity: push too hard and the potential gain can be more than outweighed by the time lost, but get the balance right and not only are you running in a strong position anyway but the opportunity is right there in front of you if others choose a riskier approach. The name of the game this weekend then was to establish the best race pace to give the maximum opportunity for success. Friday’s pair of 60 minute practice sessions saw both cars performing well and with astonishingly close times between the two, #81 and #82 just mere thousandths of a second apart in the first two sessions: there was trouble though for the #82 car in the third session, after Lasserre was caught out by a triple whammy of turning in and braking at Ascari just as the car hit a particularly wicked bump and with the car having just had the car’s brake bias adjusted. But sportscar racing is very much a team game and the Team LNT boys swept into action as soon as the car was brought back to the garage - with front end damage. The efforts proved very worthwhile with both LNT cars performing faultlessly in the 20 minute qualifying session, Danny Watts leading the session early on in the #81 car and Richard Dean then going second in #82. It wouldn’t stay that way unfortunately, but then the Porsche and Ferrari young guns got up to speed and the Esperantes slid down the order: 8th and 12th was the final reckoning but the lap times were competitive in a very closely matched class battle. The Monza 1000kms proved for Team LNT to be a tale of two cars, of bad luck and of a plan which worked, but with work still to do. 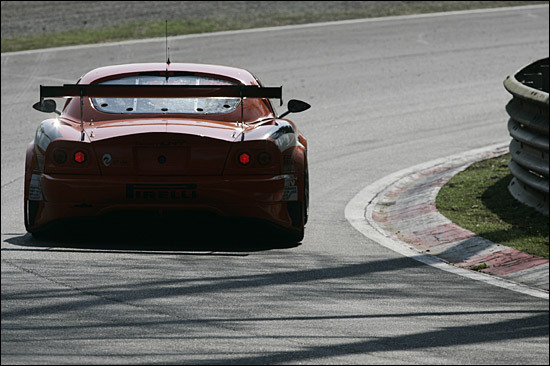 From the green flag both of the orange Esperantes made progress, Tom Kimber-Smith immediately up to sixth place in the #81 car and Richard Dean progressing too, but the #82 car’s progress was about to be delayed substantially by a spin, after contact with the ’85 Spyker in the Ascari complex. “It’s open to debate whether the clash with the Spyker was me being impatient or him being a bit tough that early in the race,” commented Richard Dean. Either way, the early ‘off’ was the prelude to an all too early retirement. Lucas Lasserre will have to wait for a while longer for his Team LNT race debut, the early exit for #82 almost certainly means it won’t be on the grid for round 2 at Valencia, because the Spanish circuit can’t accommodate the full 50 full season entries for the Le Mans Series and the organisers have decided that the GT2 class will have to be cut back for that one. It wasn’t over for the #81 car though, far from it. Tom Kimber-Smith was unable to match the ultimate pace of the leading cars but was playing a waiting game, lurking close enough behind both to put them under pressure and to wait for the almost inevitable problems that lay ahead. 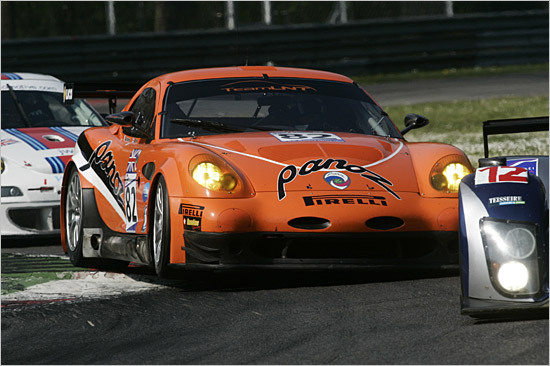 Danny Watts would be next aboard the #81 Panoz of course and he was up to fourth place as the race moved through its second hour and the pit stop strategies of the leading teams started to emerge. 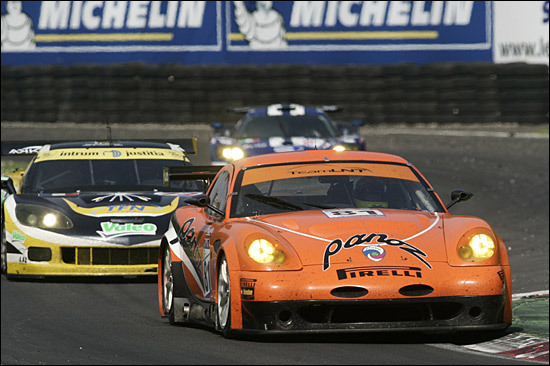 Watts looked far from the relative newcomer to sportscar racing that in reality he really is. His lap times were fast and consistent and the car came back to Kimber-Smith at the end of an impressive first racing stint aboard the Esperante “just how I hoped it would”. Not every racing driver can exercise the self control that it undoubtedly requires to lap to a fast pace, time after time, and remain mechanically sympathetic into the bargain. Kimber-Smith kept up the momentum and the race began, slowly but surely, to turn in LNT’s direction. 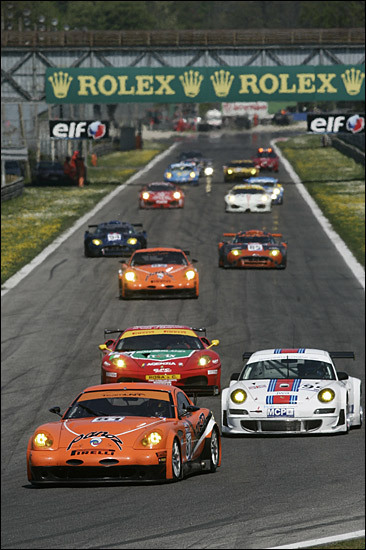 The Porsches in particular were struggling to stay with the pace required to contest the lead, first the Farnbacher Racing car, Pierre Ehret suffering a very scary steering failure which required a long pit stop and then Marc Lieb, the Felbermayr Proton car losing all but fifth and sixth gears and gradually falling into the clutches of the Esperante. The Ferraris though were ploughing on with barely a hitch, and the Panoz, for this weekend at least couldn’t quite match their pace. Danny Watts could do nothing to close the gap and the #81 Panoz would finish just off the podium in a frustrating 4th place. The team though were taking pluses and minuses from the experience. 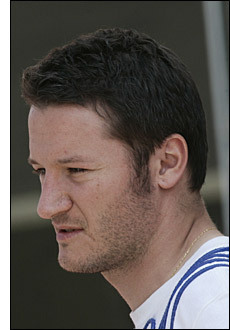 The performance of the #81 crew was one of the pluses, Tom Kimber-Smith continuing where his excellent 2006 season had left off. Last season saw TK-S finish off the podium just once in 17 race starts, that being at the season opening run for the team at the 12 Hours of Sebring. 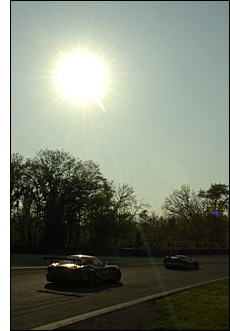 At Monza, the first race of the 2007 season, a podium was almost close enough to touch. Wil that be the last time this season that he has to suffer that frustration? That’s the difference between these boys and us ordinary folks, Watts and Kimber-Smith find it “easy” to reel off hour long streams of consistent laps at huge speeds, whilst all the while looking to get past slower cars and avoid delaying the much quicker LMP cars. And by consistent we mean reeling off a series of complex turns, super high speed straights and challenging high speed bends all within tenths of a second of the benchmark from the previous lap. Try it on your Playstation and then try to imagine what the reality is like! Next up is a three day Pirelli test at Estoril, where LNT will be looking to close the gap.